to throw a fantastic party! Yuri's Designs is a brand new full service party boutique on etsy.com. Here you will find cute party decor for your little ones' celebrations. 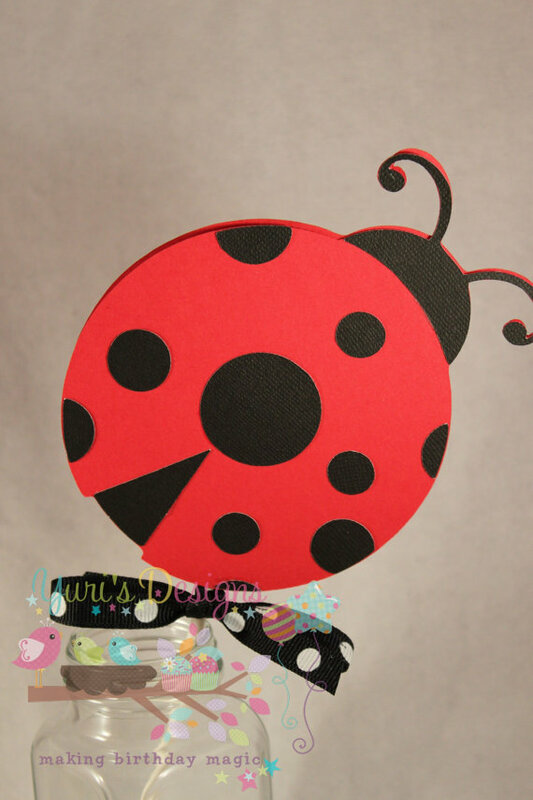 Yuri's Designs offers many custom and personalized party supplies. Yuri's Designs is giving away a $25 shop credit! What a fantastic party you'll be able to have! Visit Yuri's Designs and leave a comment sharing what you'd pick and what kind of party you'd throw. Her shop is closed so I can't look at it, but from the pictures on your blog an owl themed party would be super cute! Her shop says it is closed :( But I was JUST looking for cupcake toppers this morning- when it opens again I will be sure to take a look around! her shop is currently closed, so I wasn't able to see anything, but I went to her blog, and I really like the monkey stuff that she has posted. I'm doing a Hawaiian Luau for my daughters and I'd love to have her make some bottled water labels and cupcake toppers. Love the ones in the picture on your blog. I love this! 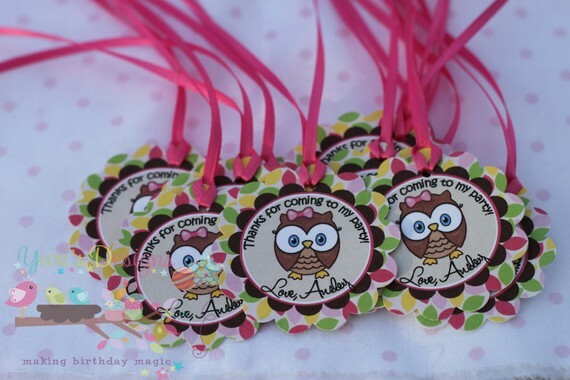 I love the owls and would use them at my daughters Birthday party coming up! My niece loves Dr. Seuss so I would throw a party for w/ that theme! love the cupcake Dr. Seuss toppers she has sold! I think the monkey and lady bug party supplies are adorable. Shop is closed but planning a birthday party soon and would love to take a look when it opens again! 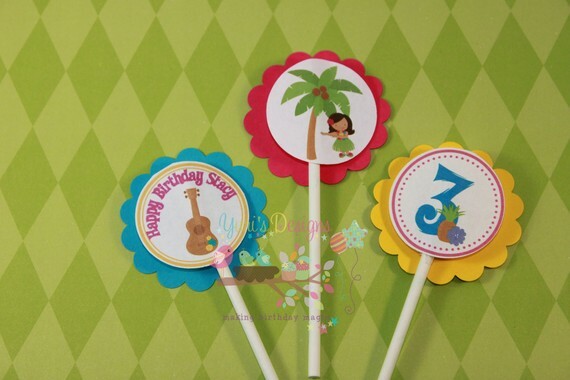 I like her hawaiian themed design pictured on this blog and I'd use it for my daughter's birthday! She has closed her shop or I would tell you what I woulr order. =( I can't wait to see what she has to offer. Shop is closed in order to fill ALL ORDERS!!.. I will not be open untill I clear my whole stack!.. I am a Yuri Twitter Follower. FYI, your link to her blog isn't correct. But I am now a follower to her blog. I like the monkey cupcake toppers. I also like the owl designs. So cute. I follow Yuri's designs blog. I'd pick the Lady Bug supplies for my daughters birthday! I love the summer luau--we need to have people over sometime to see our new kitchen anyway! I love the "Look Whoo's Turning Owl" line! I'd use it for my daughter's birthday coming up!! I now follow her blog!! My daughter would love the Girls Mod Monkey cupcake toppers for her birthday. I love her sticker/labels that you can choose your own design. So awesome! I like the Mod Boy Monkey- so cute! I would love it for my little man's first birthday. I'd get the circus cupcake toppers for my nephew's birthday! I love the Summer Luau- this would be perfect for a housewarming party in a few weeks! I would probably pick the Paper Straw Cupcake Toppers as one item towards a summer bbq party. I shared on twitter - http://twitter.com/#!/HisPrincess886/status/81364715351195648. I shared on fb - https://www.facebook.com/FunkyPolkaDotGiraffe#!/permalink.php?story_fbid=152575744815475&id=100001891505536.